Wedding season is around the corner and at our office, this usually means a rise in cosmetic procedures. Whether you’re the bride or groom, or if you are simply a participant or a guest, having a bright beautiful smile is now back on the priority list. There are many paths to a whiter smile, some are easy and inexpensive, while others can put a bit of dent in the pocketbook. is simply superficial staining that has built up over time. 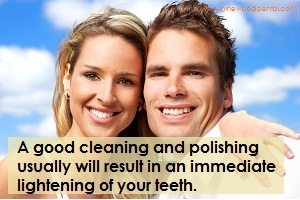 A good cleaning and polishing usually will result in an immediate lightening of your teeth. Follow up your fresh new smile with the purchase of a mechanical toothbrush. There are several brands of electric toothbrushes out there, as long as they come with a wall charger, and are not just battery operated, they should work much better than a manual brush to maintain your healthy smile. Teeth whitening procedures have become commonplace and prices have come down significantly. Everyone’s teeth tend to whiten at different rates however, so some products may work for you while others may seem like they accomplish nothing. Over-the-counter whitening products are effective, but tend not to give you that “wow” factor. Also the results usually fade pretty quickly. The most effective and long-lasting method of whitening is consistent at-home whitening with custom trays made by your dentist. Follow that up with an in-office whitening treatment and you have a recipe for bright beautiful teeth! On a scale of 1-10 how do you rate your smile? Is there something about your smile that you would like to change that you’ve simply never had the motivation to take care of? Maybe you have one crooked tooth that has been an eyesore, or possibly some minor spacing or crowding of your teeth that always has bothered you. Get a cosmetic consultation with your dentist. Perhaps you can correct that problem with some easy to wear removable orthodontic aligners, or possibly enhance your smile with porcelain veneers. Both options can result in amazing results, achieved in a very small amount of time. If you are helping to organize a wedding, remember the bride and groom are not the only ones in the spotlight. People are looking very closely at the mother and father of the bride and groom as well as any one else taking a prominent role. It may be a hard conversation to have, but if you notice something obviously wrong with their smile: a missing tooth, a dark spot that may be a cavity, you should definitely let them know. Trust me, they’ll thank you later when they see how beautiful their pictures turned out! You never want to wait until the last minute to get that check up. If the dentist finds a problem that needs to be remedied, getting in early is always a better way to go. Fixing a cavity may not take very long, but if more extensive work is needed you definitely don’t want to wait until the week of the wedding to get it fixed. The last that anyone wants is to be miserable with tooth pa on their wedding day.Which brings us to the honeymoon! If you plan on going out of town or out of the country, go see your dentist well before you leave. You don’t want to be forced to seek out a dentist in an area you are unfamiliar with. Depending on where you go, the quality of care may not be at the standard you are used to, which can make for some rather difficult and uncomfortable decisions about your dental care. Finally, if you are getting married soon and if you are not totally satisfied with your dentist, this is the best time to look for one that you can keep for the long haul. Maybe your fiance loves their dentist. Consider switching, so you can both be seen at the same practice. Does your dentist see children? If you plan on starting a family, this suddenly becomes a pertinent question. Just as you are making an important decision about who you’ll be spending the rest of your life with, it’s also important to use this moment to plan out other aspects of your life. Medical, dental, financial, professional, all of these parts of your life now should be considered with your future family in mind.